EVA MELUSINE THIEME lives in Tennessee with her husband and four children. 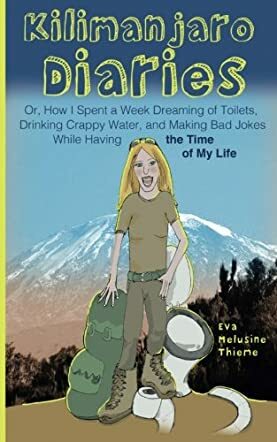 Her travel memoir Kilimanjaro Diaries: Or, How I Spent a Week Dreaming of Toilets, Drinking Crappy Water, and Making Bad Jokes While Having the Time of My Life was published in March 2014 and subsequently translated into German. Both editions have become Amazon bestsellers in African travel literature. She is also the founder of Joburg Expat, an award-winning blog chronicling her family's life in Johannesburg, South Africa. Her articles on expat living, travel, and parenting have been published in numerous publications, such as the Wall Street Journal, SA People, and Kansas City Parent Magazine. Her other accomplishments include surviving three years in "the world's most dangerous place," having grasped the difference between "just now" and "now now" as expressions of South African time, and - so she likes to think - remaining sane with four teenagers in the house. Kilimanjaro Diaries by Eva Melusine Thieme is about climbing the highest mountain on an entire continent and the highest free-standing mountain in the world. The preparations for this trip, starting with an internet survey, began well in advance, including practicing with climbing boots for the last three months before the trip. The trip passed through dark forest and inhospitable trails and followed a route with good success rate: The Machame Route – also called Whiskey Route. The book mentions an eerie silence there for company, though that is a bit disquieting; concentration is fully on the climb. On the sixth day of their climb, they spot ‘Congratulations! You are now at Uhuru Peak 5895 M A.M.S.L.Tanzania’ and take a return route only used for the descent. Kilimanjaro Diaries by Eva Melusine Thieme gives a vivid description of the planning behind the trip, specially the ‘pee’ problem and its solutions. The diary closes with an interesting situation; I certainly won’t be envious of it. This book also contains information regarding a packing list and tips on routes and climbing seasons, as well as many web links, making it a good reference material for this trip. An interesting, educative and fun filled narrative replete with adventure. …a cross between "A Walk in the Woods" and "Wild." Thieme has a fun sense of humor which she balances nicely with her personal "lessons learned" from her experience. ...very well written in a humorous and honest way with little snippets of historical information about the mountain, its routes and famous climbers. As informative as it was entertaining. A great read - even more so if you are actually contemplating climbing Kilimanjaro. I'm a month away from embarking on my own Kilimanjaro climb, and in my preparation, I've read countless articles, blog posts and books by authors chronicling the story of their Kilimanjaro excursions. This book is by far the best of them that I've read. ...wonderfully written, with great humour, and also provides really useful advice on what to take, the best time of year to go etc. ...down to earth, honest, realistic.